Brave Musician™ is a movement of courage and artist empowerment for musicians – with resources for creative confidence, business tools, and a community to help you be your best Brave self. The world needs help navigating what it means to be a musician. Brave Musician was created to facilitate the challenging elements of developing the soft skills of musicianship - everything we don't learn in school. Together, we can make an impact by getting more people to play music, make careers out of music, encourage creative entrepreneurship within the music industry, and empower people through music. We want to do good while we make great music. In-person workshops that develop creative confidence, business tools, and soft skills of musicianship. A series of conversations, stories, and educational content to inspire and empower. A gathering of fellow Brave Musicians to help each other create a safe space to practice being Brave. A personalized one-on-one coaching program to help you work through a specific challenge. Are you a Brave Musician? Show it proudly with our official Brave Musician Merchandise. ALL proceeds go towards creating programs, services, and resources for musicians around the world. For every 100 items sold, we will donate t-shirts to an entire classroom of Brave Musicians (up to 25 people). “The Brave Musician clinic brought the question ‘What is the worst that could happen?’ to mind. As more of a shy person, I become apprehensive in situations like jam sessions and creating a social media presence. This question has helped me to deal with those feelings in a positive way. It helped me to realize that while I may feel nervous in a situation, it's easily overcome. 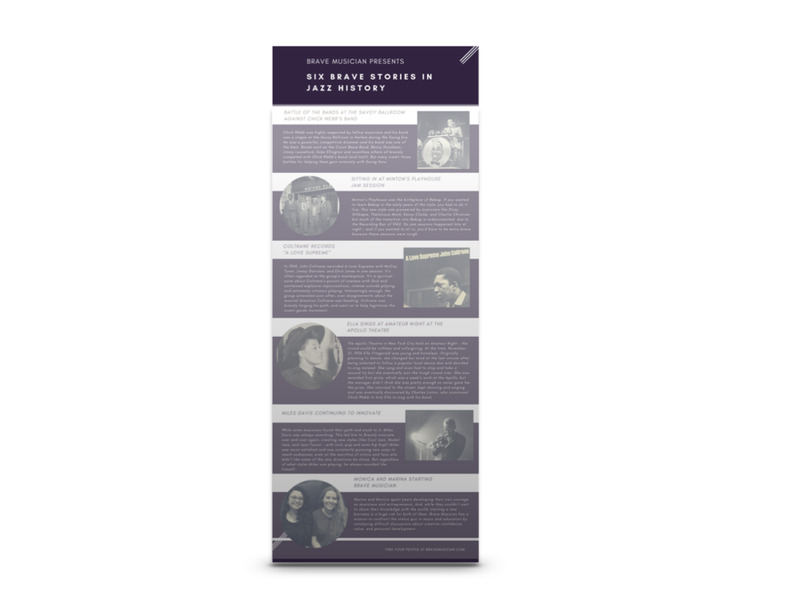 Since the clinic, I've started to make social media posts and begun to attend more sessions remembering the question, ‘What's the worst that can happen?’"
Thank you for signing up to download our Six Brave Stories in Jazz History poster! Check your email to download the digital poster.